This is a rectangular Ellisons Flour porcelain sign. This particular Ellisons Flour sign is predominantly white with blue banners across the top and bottom. 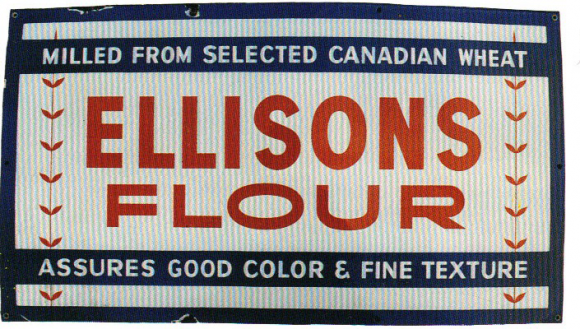 It reads, “Milled From Selected Canadian Wheat, Ellisons Flour, Assures Good Color & Fine Texture” and features red strands of wheat on either side of the sign.